Very clear DIY. I would recommend that people not reuse the existing valve cover gasket though. I did (since mine was basically new), and a week later noticed oil leaking at multiple locations. How was your mileage affected by the new cam? Sooo... another lesson learned the hard way. Didn't have a torque wrench, but I tried to go ahead and do this install anyways. Everything was going fine until the very last bolt, which I over-torqued and ripped the threads out of the hole. Not all the threads, half the threads. The bolt won't tighten down, just spins, but it won't loosen with finger pressure (ratchet wrench clicks past it). The one circled, like I said the very last one. I believe I'll have to retap the hole and go for a slightly larger one bolt... the gasket seal is pretty good still, but I'll just have to replace the valve cover when I see someone selling one. wow you messed up big time man! The bolts that hold the cams are very critical parts because the cams spin at high rpm. 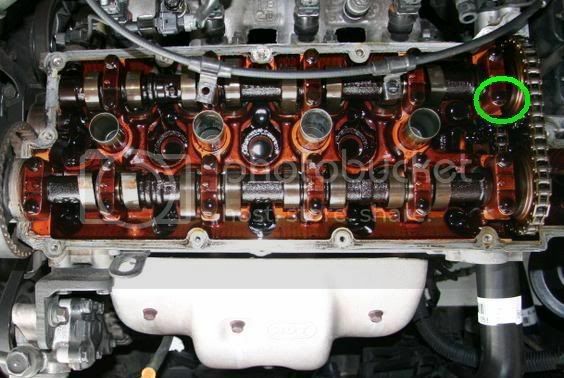 If you don't fix it RIGHT, you might end up replacing the whole engine including internals. I was wondering if I could fill it then retap it at normal size, what fill could I use? Or just better rethread it at larger size and find a bigger bolt? Ooo, someone finally beat me. LOL. I stripped the threads for the tensioner pulley and had to re-tap the hole in the 4 inch space between the side of the head and the engine bay. yeouch. oh, and those valve cover/spark plug cover bolts. I've lost MANY of those (but not in the engine.. lmao.gif), and found a hardware store that has the exact bolts in shiny silver! yay. tried home depot.. tried Ace... but TrueValue is where I found what I needed. ANY BOLT IMAGINABLE, they'll MAKE you a bolt to your specs if need be. They have like 4 aisles of their store dedicated to nuts and bolts. And you get shiny new silver ones! oh and use a magnet for metal shavings. and lay down LOTS of protection for the inside of your valvetrain before tapping. TrueValue? I don't think they have that store in this area, never heard of it... I'll have to search on that one. Question is, do you guys think I could make that drive? Bolt is too long to get out of its hole (valve cover stops it) and the chain guide which is well secured (not pictured) is helping hold down the bracket. I just ran the car for a couple minutes (was really rough, forgot to reset the ECU) and I opened up the valve cover and everything is the way I left it. Seems I did the install correctly, minus not having a torque wrench. or you could just heli coil it yourself. First time I stripped a hole in the head, I was like "WTF is a helicoil?" went to TrueValue and found out. It's a pretty straightforward process. Nothing you can't figure out (I mean you can swap cams, ..sorta). you're basically buying threads and a matching bolt and after inserting the threads (looks like a mini slinky but not bouncy like one) you just screw in the bolt, ta da. And it's harder to overtorque them once they're in.